So you’ve bought a Raspberry Pi but you still need a case to go along with it. You could get a standard case or better yet, you could design something yourself! 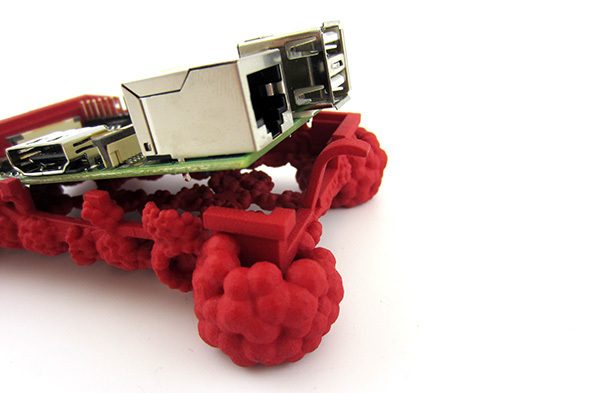 Before you let your imagination go wild, sit back, relax and check out of these tips and tricks on how to get started on creating and 3D printing your own Raspberry Pi case. Obviously, when designing a case for something, whether for a phone or a Raspberry Pi, you need to start off knowing its dimensions. 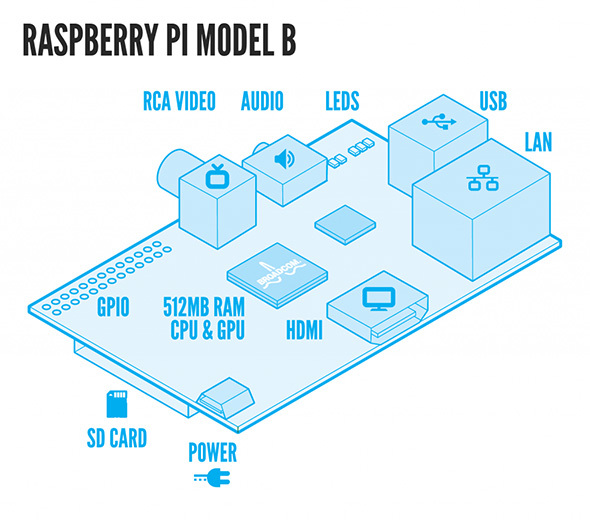 The Raspberry Pi measures 85.60 mm x 56 mm x 21 mm (or roughly 3.37″ x 2.21″ x 0.83″), with a slight overlap for the SD card and connectors, which project over the edges. 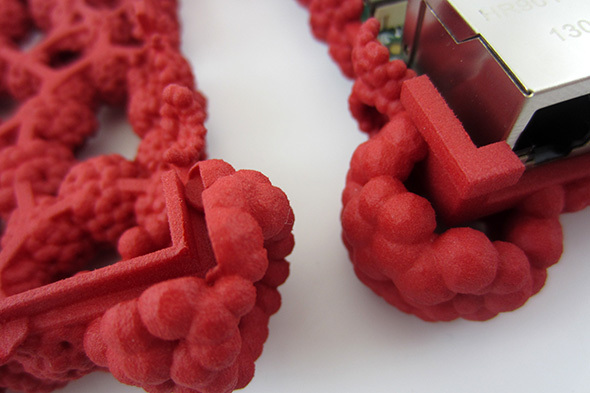 It weighs 45 g.
Download a 3D model of a Raspberry Pi and design a case around it. To be safe, cross-reference the dimensions of the downloaded model with the dimensions mentioned earlier. Don’t know where to find one of these 3D models? Take a look at the list of resources included at the bottom of this post. Don’t design a case that fits perfectly around the Raspberry Pi. You need to take into account the amount of clearance the material you’re designing for requires. For most materials, a clearance of about 0.4 mm should do the trick. A case comprises a top and a bottom part. Start by designing the whole case first then cut the finalized model in two. Try fixing the top and bottom parts without using screws. 3D printing offers a lot of possibilities for designing a case with snap fits (e.g. clicking, using pins). Don’t forget to think about ventilation. 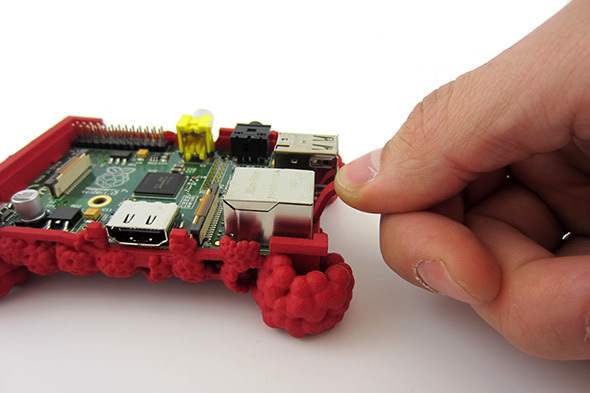 Although only the size of a credit card, the Raspberry Pi still is a computer and computers need ventilation. 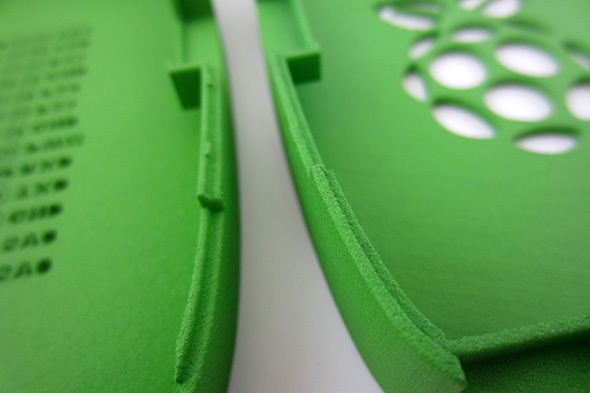 Incorporate some holes in your design to allow for airflow. Many designers take advantage of the Raspberry Pi logo for this (see example below). 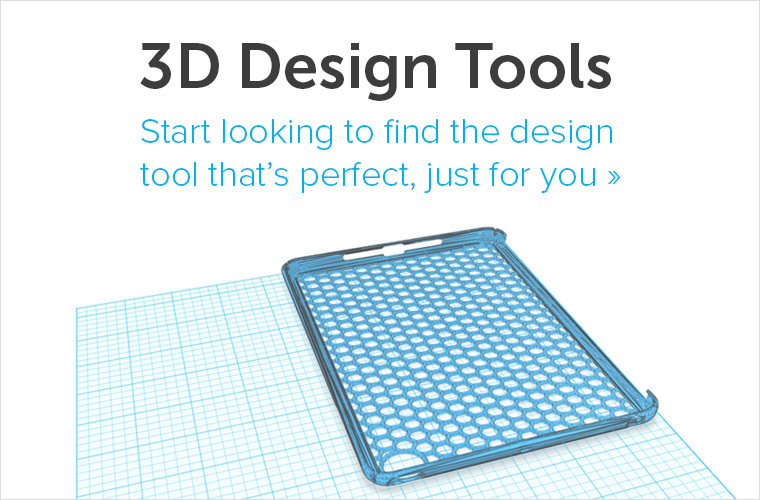 If you’re not already an avid user of commercial design software like SolidWorks, Pro/ENGINEER or Rhinoceros, try out free alternatives like 123D Design, Tinkercad or SketchUp. All have large communities that have already designed and shared Pi cases that you can freely use and learn from. Whether you were thinking of making a simple housing for your Pi, a robot, or even a cabinet for retro game consoles, 3D printing will give you the freedom to realize something truly unique. 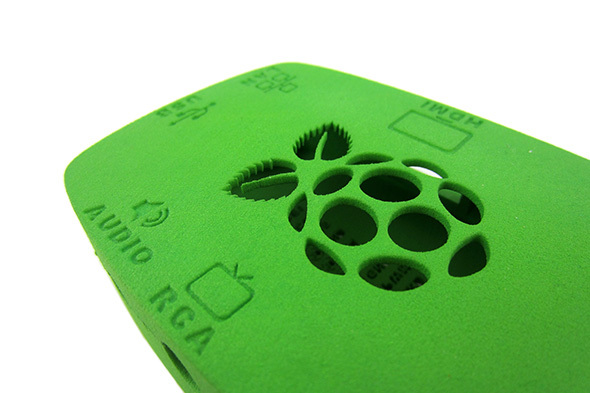 Our material of choice for Raspberry Pi cases is polyamide because it provides the greatest freedom of design. The material can also be finished in numerous ways, from spray painting and color dying to fluffy velvet. The Raspberry Pi Information Case by Kristóf Várnai is a great example that includes some of the tips and tricks mentioned above. The top and bottom fit perfectly together and the logo cutout ensures adequate ventilation. The designer also added a cheat sheet on the bottom for GPIO and labeled all of the connection ports on the top part of the case. 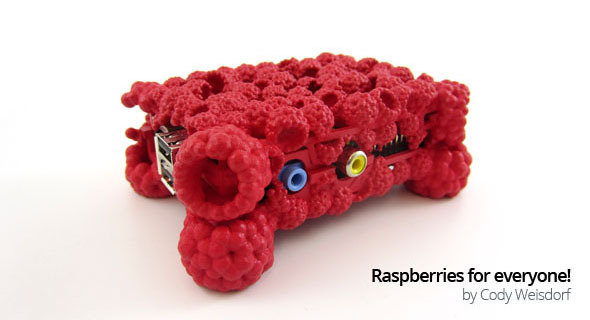 Raspberries for Everyone by Cody Reisdorf was the winner of our Raspberry Pi Case Challenge last year. To make sure we could easily get the Pi out, one of our design engineers added a small lever to the design. The lever has a small clip at the bottom so the Pi stays fixed in place when in the case and, when you want to remove the Pi, simply pull the lever and the Pi pops out. You can also see in this design another example of a perfect snap fit connecting the top and bottom parts. We hope this helps you get started designing your perfect Raspberry Pi case. Do you have any additional tips or tricks you’d like to share? Please add them in the comment section below. Want to learn how to create other tech gadgets yourself? Read our articles about customizable iPhone cases, Apple Watch accessories, and GoPro mounts. 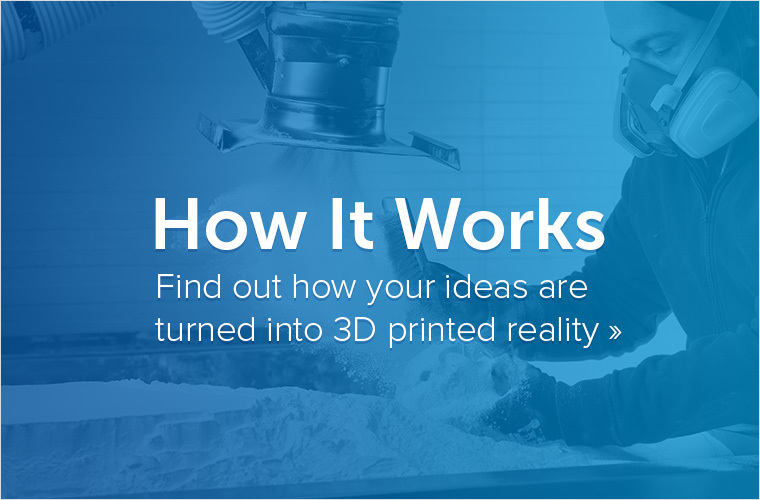 Once you are satisfied with your 3D model, simply upload your 3D file to our website and get an instant quote for a perfect high quality 3D print. 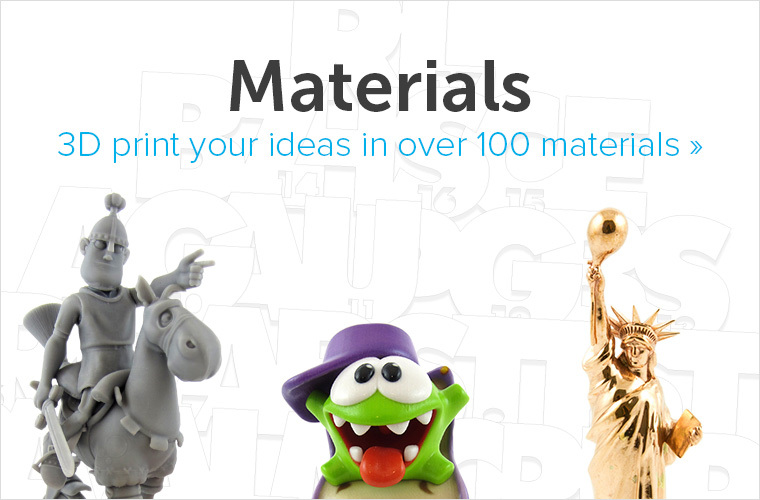 Learn more about our more than 100 different 3D printing material, color and finish options here.